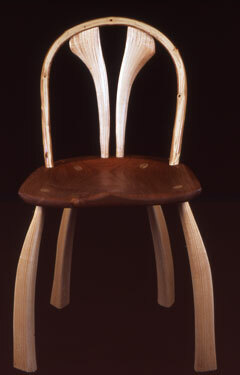 In 1994 Gudrun won a substantial contract to pole lathe turn 500 green oak balusters for Shakespeare's Globe Theatre in South London. 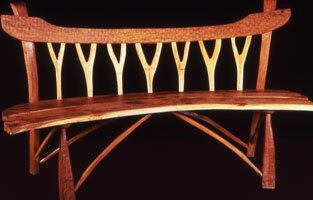 She completed the work in 1996, and has been concentrating on smaller commissions since. 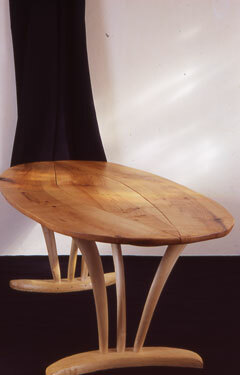 Since 1992 Gudrun has made and exhibited an acclaimed range of contemporary sculptural furniture. 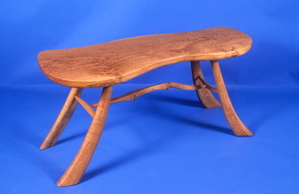 Locally sourced oak, ash, yew, walnut and other fruitwoods are worked by hand and eye into site specific and unique pieces. 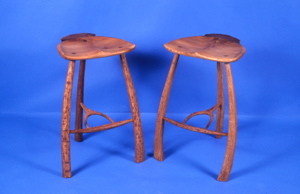 Each commission is discussed in detail with the client and it then takes nine to twelve months to complete a very individual piece from the chosen timber. 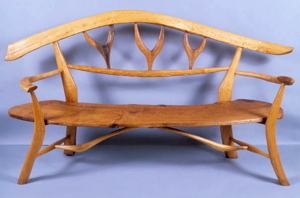 The pieces sell as far as Japan or as locally as descendants of "Arts & Crafts" chairmaker Philip Clissett who lived and worked opposite Gudrun's workshop. 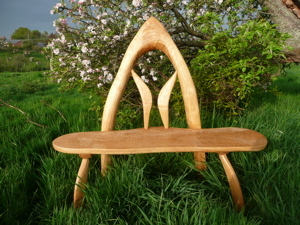 Gudrun exhibits in November at the Hereford Contemporary Craft Fair and in the summer at Twenty Twenty in Much Wenlock. 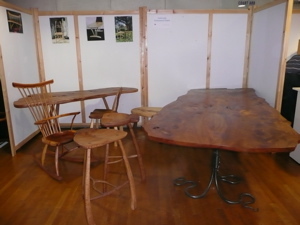 Below are pictures from Hereford. 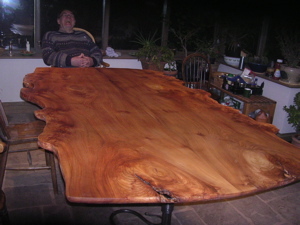 Elm table with metal base by Gavin Fraser in 2006, pictured with happy customer. Memorial bench on right.